Here's G.E. 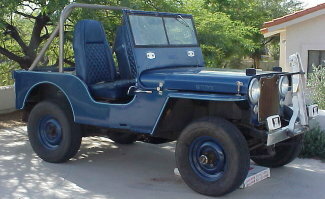 McKelvey's 1947 CJ2A. "I just purchased a 1947 CJ2A in Pine Arizona. The owner said it has been in the same family since purchased new in Riverside California. It runs well, needs a few safety things like seat belts, and is a blast to drive. Reminds me of the old Jeeps used by the USGS where my father taught me to drive in the mid 1950's. The engine number on my CJ2A is J-88667, the Willys Serial Number is CJ2A-87353, The Willys Body Number is CJ2A - 87858"